This G.2 replica features a full zinc alloy metal shell, and is the perfect addition for any gun enthusiast or those looking for a perfect practice or target pistol. This G.2 replica comes with a push-button magazine and has a realistic weight and feel. 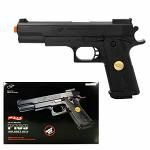 Designed for competition or practice this full metal airsoft pistol is built to last through years of use! 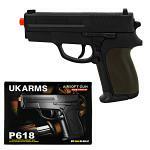 This is a great pistol for those looking for a reliable versatile sidearm that packs a serious punch. 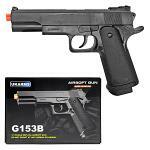 Don't forget to stock up on Airsoft Ammo! (L x W x H) 7.88" x 5.63" x 1.63"